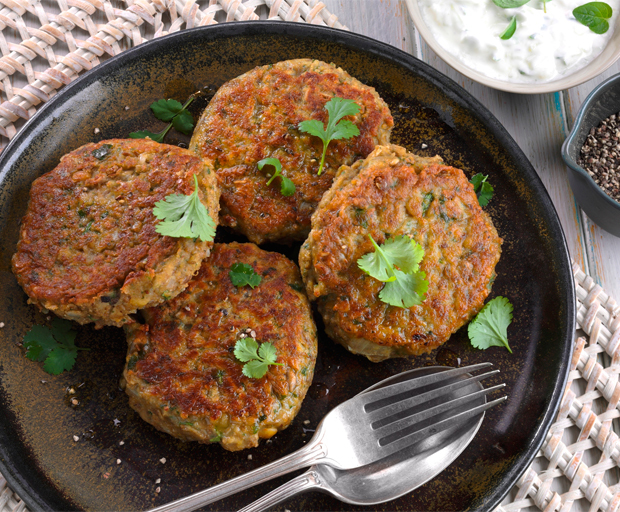 Whether you’re looking to spice up your dinner roster or introduce more vegetarian recipes into your weekly meal planning, these great tasting, protein-packed Spiced Lentil and Chickpea Patties are ready in only 30 minutes from start to finish which makes them one of our favourite quick dinner ideas. For the perfect blend of flavours and crunch, simply cook the onions until soft with garlic, turmeric and cumin before adding to a blender with chickpeas, lentils, sunflower seeds, coriander and eggs. Once combined, shape into patties and pan-fry. You can also add extra veggies, like corn or peas. Then it’s up to you how you want to serve them: stuff them in toasted pita pockets with tzatziki and salad, top with a mango and avocado salsa for a refreshing twist, or try them in the best veggie burgers you’ve ever had. Any leftover patties make the perfect sandwich or wrap for next-day lunch. 1. Place a fry pan onto medium heat, add olive oil and diced onions. Cook until softened, stirring occasionally. 2. Add garlic, turmeric and cumin and cook for a further 2-3 minutes while stirring. Place into a food processor, leave to cool. 3. Add chickpeas, lentils, sunflower seeds, coriander, eggs and seasoning into the food processor. Blend until smooth. 4. Transfer mix into a bowl, add flour, combine and form into 8 patties. 5. Place frypan onto medium heat, add vegetable oil and panfry patties on both sides until golden. What are your go-to quick dinner ideas?